One of the students who was giving us a tour described the process of creating and revising a design goal as the driving force behind their project-based learning. As an Innovation Study Group and as a larger community, we are now at the place where we need a design goal to guide our next steps. How do we synthesize a variety of perspectives and create spaces that are nimble enough to flex, grow and change as we do? More importantly, how do we foster the idea that we are a community of learners, ready to take on the challenges that face us as both local and global citizens? To gather another perspective, I spent some time at Olin speaking with a fourth year student about her experiences in middle and high school as well as in college. I asked her how her time at Olin had shaped her view of her earlier educational experiences. I asked her if she could take one element of her learning from Olin and apply it to those earlier years, what it would be. Without hesitation, she replied, "Trust." She explained that professors and staff at Olin trusted her implicitly from the moment she walked through the doors as a first year student. Whereas many of her friends at other institutions still considered themselves "just students," she quickly stepped into the role of engineer because of this trust bestowed upon her. Pointing to student-created projects that lined the halls, she remarked that students at Olin are expected to solve real problems while working collaboratively with their peers as well as professors. She told me that she wished her middle and high school teachers had trusted her to"build things, make mistakes and learn from those mistakes." 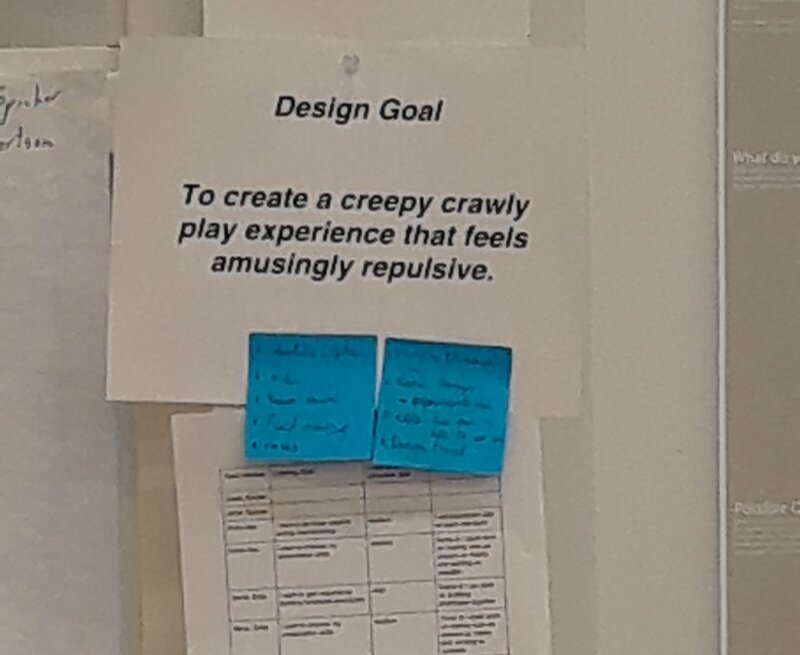 I think we can learn from the design goal in the picture above. We may not be creating a "creepy crawly" experience but I think we need to trust students and each other to "play" with what learning looks like in our schools.